Another week, another school shooting, this time in Santa Fe, Texas and another activation of a mass casualty response for the medical teams in the area. Aside from the police visible on the scene, the emergency medical response starts up. From first responders to paramedics and emergency department and operating room staff, people get ready to care for those who are injured. A successful response requires lots of players, but it all begins with triage and the unlucky soul who is the triage officer on scene. There is a person, (sometimes a team depending upon the number of injured) whose job it is not to look after victims, but to decide about injury severity and survivability, and sort who is transported first to the hospital and who can wait. Remember M*A*S*H*? 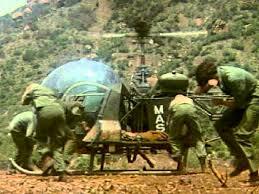 Hawkeye and Trapper/Hunnicutt would meet the arriving ambulances, pointing who needed to go to the operating room first. Now imagine having to see the victims in the field before the ambulances got there and deciding who needed to fly, go by ground or not go at all. The triage doc’s job is to hand out color tickets that designate who is hurt and how badly, and whether survival is time sensitive. Poor sorting may cause a mismatch of resources. Trauma designated hospitals have staff and equipment geared up to care for the most injured, and that preparedness increases trauma survival rates compared to patients seen in community hospitals. 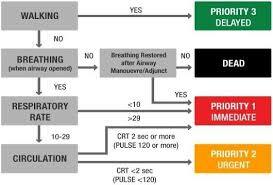 Triage has to figure that out in just a minute or two at the victim’s side. Red tags are used for the most critically injured whose survivability depends upon immediate transport and access to care. Green are the walking wounded. Though they may be in pain, cuts, scrapes, broken bones all can wait and often these patients are transported by buses to a community hospital for care. White victims are fortunate. They aren’t physically hurt and don’t need care. Black is bad. These patients have been killed or so severely injured that even with care, would not expect to survive. Triage is hard. Tagging a patient and walking away to leave care to others is not what most medical people are trained to do. Triage is also fluid and patients are re-triaged, not only in the field if possible, but also when they reach the hospital. Literally in the ambulance bay, the Hawkeye/Trapper/Hunnicutt scene is played out and depending on the individual need, the patient is sent directly to the OR, the ER or ICU. Other parts of the hospital open for the expected walking wounded. All this works well in urban areas where there may be an abundance of medical resources, but in rural area, where a small hospital. Remember the Humboldt Bronco hockey team bus crash in rural Saskatchewan that occurred at the intersection of two rural roads, 200 miles from major hospital. Distance from a large facility with all the bells and whistles, plus weather, plus patient stability will affect potential to survive. Once up on a time, disaster drills were just drills and most hospital staff tolerated the inconvenience of having their routines disrupted to go through the response steps for an event that would never happen. It was all about preparing for plane crashes, factory explosions, and fires. The real world has changed that attitude. People in the trenches are paying attention. The shootings are real world disasters and the next one might happen next door. What we wish we knew about concussion and CTE would make life easier for athletes, their parents, coaches and league administrators. It’s tough to remember that concussion research is in its infancy and the final answers about the way the brain reacts to injury, both in the short term and long term is still a mystery. Regardless of the headlines, there are many things we don’t understand. What should be common sense, may or may not be true. The only way to diagnosis chronic Traumatic Encephalopathy is after death, by autopsy, and using special techniques to look for abnormal proteins in brain tissue. Tau proteins are located in the brain and help stabilize microtubules inside brain cells called neurons. Abnormalities of an enzyme may cause tau proteins to fold abnormally and clump into “neurofibrillary tangles”. Other brains cells may also be affected. While the diagnosis of CTE may be suspected because of symptoms like depression, suicidal thoughts, confusion, and short term memory loss, there is no test available for patients to confirm the diagnosis while they are alive. 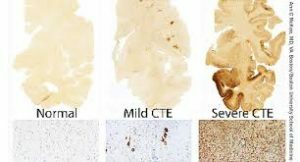 The pathology findings under the microscope suggest that there is a difference between Alzheimer disease and CTE based on where the tau tangles occur and the presence of amyloid plaque (a sticky protein) seen in Alzheimer. The relationship between head injury and CTE seems to be well established. Using boxing research, it may be the number of hits to the head that make a difference as opposed to whether a concussion occurred. Studies suggest that “punch drunk syndrome” leading to dementia pugilistica found that it was the number of rounds boxed that was the important factor in determining long term brain issues, rather than the number of concussion. This presumes that we know how to make the diagnosis of concussion and the answer is that we don’t. There is no test to confirm that a concussion has occurred. We know a concussion when we see it: a player who is temporarily confused or knocked unconscious, has a brief seizure or has an abnormal neurologic exam is an easy diagnosis. Many times, the symptoms of concussion may be delayed by hours and those symptoms may be subtle, involving sleep disturbance, ability to concentrate or minor changes in personality. A concussion may be caused by a direct blow to the head, face or neck or it may be caused when a force to another part of the body is transmitted to the head. Imagine a car wreck where the seat belt holds the body in place but the head whips back and forth. Not only can we not diagnosis a concussion with certainty, we also do not know when the brain has healed itself from injury and has returned to “normal”. Making the link between head injury, concussion and CTE seems to have occurred, but the question there are plenty of questions left to answer. Does CTE risk increase with the number of concussions or does is it the age of the brain when that first concussion occurs? Contact sports increase the risk of head injury and the prevalence of CTE in NFL players has led to lawsuits to care for players who develop debilitating symptoms after their careers have ended. In soccer, recent research suggests that heading the ball affects brain function more than head injury caused by collision. This supports the concept that the number of minor hits may be as important or perhaps more important than a single concussion. Newer recommendations from research have suggested that concussed brains that are not fully developed are at higher risk for future behavior problems and decreased executive thinking, including initiating activities, problem solving, and planning and organizing. The suggestion is that between the ages of 10 and 12, the brain is undergoing major growth and development and may be particularly vulnerable to injury. Recommendations suggest that tackle football should be avoided before age 12. The NFL and NHL rightly are concerned about the long-term consequences of head injury to their players. Those who make it to the pro level have played more games at a higher level and presumably with more exposure to violence than those who didn’t make it to the college level and beyond. 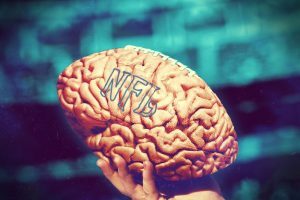 A case study published this year found that an 18-year-old high school football player with multiple concussions had, on autopsy, already developed abnormal tau protein tangles in his brain.It may be that the die has been cast for the pro…what happens in the major leagues may be inconsequential as to the development of abnormalities in the brain that are associated with CTE…or, it’s those concessions that occur because of collisions with larger and faster opponents may be the culprit. The bottom line is that research teaches us much as to the consequences of head trauma and the potential for long term brain dysfunction. It also reminds us that we don’t know what we don’t know. Protecting players at all levels of competition is a reasonable approach, but that risk of concussion will never be zero, and because of that the risk of CTE will never be zero. Asking the NFL, NHL, NCAA and high school leagues to alter the game maybe appropriate, but there is no way to know whether it will actually make a difference. We can’t make the diagnosis of concussion. We can’t make the diagnosis of CTE. We don’t know how many concussions it takes to develop CTE and we don’t know if the brain has the ability to fix itself if it has been hurt.welcome to the world of science.